The crater lake at the central North Island volcano, Mt. Ruapehu, rose slightly on Monday evening. Mt. Ruapehu’s crater lake rose abruptly following a small volcanic earthquake of magnitude 2 at 6:30 p.m. on Monday night. The lake rose 15 cm, indicating that about 20 million litres of extra water has moved into the lake from the volcano’s hydrothermal system. There was no eruption, and an inspection flight in poor viewing conditions on Tuesday morning detected no other obvious changes since the last visit on July 2nd. The rise in the lake’s level is much smaller than that which occurred following a small eruption in October 2006. At that time, earthquake activity was recorded at the volcano between 10:24 p.m. on Wednesday 4th and 5:19 a.m. on Thursday 5th of October 2006, and a volcanic earthquake registered on monitoring equipment at about 10:30 p.m. on the Wednesday night. 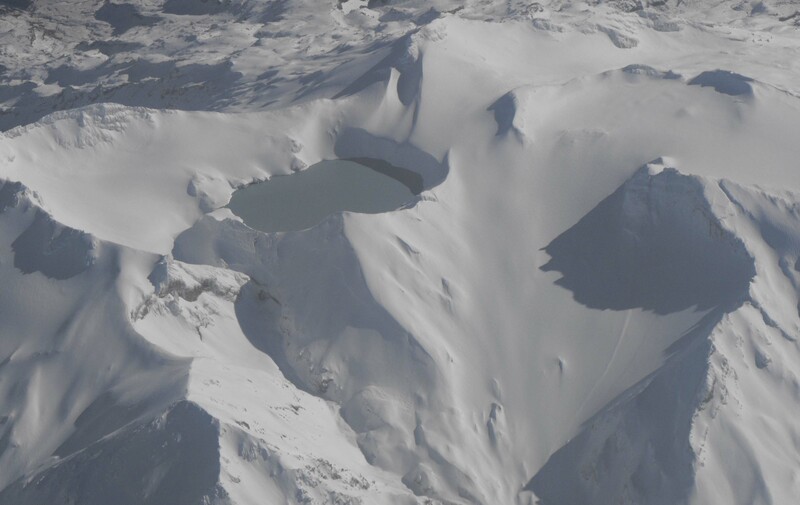 An expedition determined that a small eruption had taken place within Ruapehu’s crater, causing waves up to 5 metres in height to wash the lake’s rim. As a result, the crater lake’s level rose by a metre and its temperature rose 7.5 Â°C to 22.5 Â°C. Prior to the eruption, the lake had cooled to 13 Â°C during the first week of September 2006, the coolest it had been since the 1996 eruptions, aided by ice cliffs falling into the lake on August 30th. The lake warmed to 15.5 Â°C during the second week of September, but seismic activity was low prior to the October eruption. The lake at Ruapehu is currently 20 Â°C, warmer than the readings taken during the lead-up to the 2006 event. The correlation of the rise of 15 cm with the volcanic earthquake has been made possible by a new research project which is measuring the temperature and level of the crater lake. The temperature has not changed alongside the increase in lake level. This entry was posted on Wednesday, July 15th, 2009 at 1:29 pm and is filed under Eruptions - Observations. You can follow any responses to this entry through the RSS 2.0 feed. You can skip to the end and leave a response. Pinging is currently not allowed.